Considering slowing it down in one of the most renowned valleys in the Kootenays? Wellcome to Willowbank Mountain Ranch! Here is your opporunity to live in mountains where you'll have space to roam, freedom to do as you please and with wide open access to crown land. Suitable for an animal lover, as this property has ample out buildings including a log barn, hay shed, chicken coops, rabbit coops, pastures and evan a year-round pond which comes from spring! 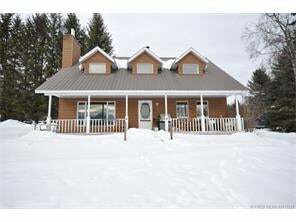 The house offers incredible views of the Purcell Range and has an open concept/vauled living room area with a loft above. Wood firepace to crackle in the evanings to set the mood - and a wood stove in the living room to keep you cozy and warm all night long. Rare opportunity to own a 1/4 section as the adjacent 80 acres is also being offered for sale. Call your Realtor® today to set up your property tour.